While the roads that lead to breakthrough scientific discovery can be as varied and complex as the human mind, the moment of insight for all scientists is remarkably similar. 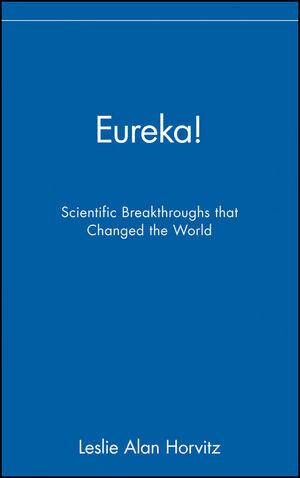 The word "eureka! ", attributed to the ancient Greek mathematician Archimedes, has come to express that universal moment of joy, wonder-and even shock-at discovering something entirely new. In this collection of twelve scientific stories, Leslie Alan Horvitz describes the drama of sudden insight as experienced by a dozen distinct personalities, detailing discoveries both well known and obscure. From Darwin, Einstein, and the team of Watson and Crick to such lesser known luminaries as fractal creator Mandelbrot and periodic table mastermind Dmitri Medellev, Eureka! perfectly illustrates Louis Pasteur's quip that chance favors the prepared mind. The book also describes how amateur scientist Joseph Priestley stumbled onto the existence of oxygen in the eighteenth century and how television pioneer Philo Farnsworth developed his idea for a TV screen while plowing his family's Idaho farm. LESLIE ALAN HORVITZ is the author, coauthor, or editor of numerous books on science and the history of science, including Level 4: Virus Hunters of the CDC, with Dr. Joseph McCormick and Susan Fisher-Hoch; The Quotable Scientist; and Understanding Depression, with Dr. J. Raymond DePaulo, also from Wiley. Introduction: A Sudden Flash of Light. 1. A Breath of Immoral Air: Joseph Priestley and the Discovery of Oxygen. 2. Epiphany at Clapham Road: Fredrich Kekule and the Discovery of the Structure of Carbon Compounds. 3. A Visionary from Siberia: Dmitry Mendeleyev and the Invention of the Periodic Table. 4. The Birth of Amazing Discoveries: Isaac Newton and the Theory of Gravity. 5. The Happiest Thought: Albert Einstein and the Theory of Gravity. 6. The Forgotten Inventor: Philo Farnsworth and the Development of Television. 7. A Faint Shadow of its Former Self: Alexander Fleming and the Discovery of Penicillin. 8. A Flash of Light in Franklin Park: Charles Townes and the Invention of the Laser. 9. The Pioneer of Pangaea: Alfred Wegener and the Theory of Continental Drift. 10. Solving the Mystery of Mysteries: Charles Darwin and the Origin of Species. 11. Unraveling the Secret of Life: James Watson and Francis Crick and the Descovery of the Double Helix. 12. Broken Teacups and Infinite Coastlines: Benoit Mendelbrot and the Invention of Fractal Geometry.